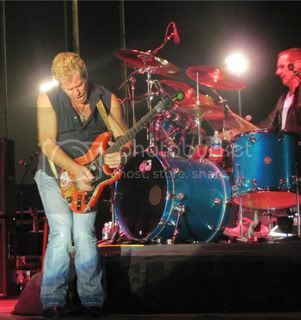 MR • View topic - Has Brad Gillis Left Night Ranger? 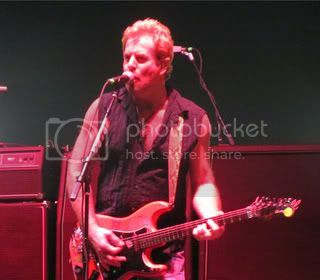 Has Brad Gillis Left Night Ranger? Hey.. I was on a torrent site called Dime a Dozen and someone who was posting a night ranger show says that Brad has left the band and joined Vicious Rumours. Now his website hasn't been updated in ages but it says he's a guest on it. Then reading further on the Vicious Rumours site it saying that he's been joining them for a few shows. Has anyone got any info? Andrew? Hi, your question is valid. Although everyone close to Night Ranger insists that Brad is only doing the Vicious Rumors thing as a side project. I myself think something is not right about how Night Ranger handled this year. Last Summer when Night Ranger was supposedly going to be on that show....Hit Me Baby One More Time.....I know that there was some disagreement within the band. I think Jeff and Brad wanted to do it and Kelly and Jack did not. At the time the first excuse they threw up was that they are busy in the studio working on a new Night Ranger cd and could not get out of the studio. A year later the cd looks no where near being complete and the guys are off doing their own thing.....canceling tour plans in the process. In the mean time no updates on the website since July of 2005. I get the impression there is something going on in the band. Maybe someone had talked about leaving and they therefore are taking hiatus hoping that that person changes their minds. All four guys are doing similar things at the moment. Brad going work with Vicious Rumors was just one of them...he is doing other things too. Jeff is doing solo stuff, working on a motion picture soundtrack, and working with another band. Jack is doing some play, President of the Rock Camp, working on a Shaw-Blades project, singing vocals on a Beatles Tribute cd, etc. Kelly is working on a solo cd and is also in a couple other bands (one with the guy from Kings X). Even, their new keyboardist is talking about a Great White reunion. 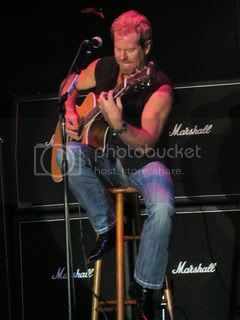 So I did not think anything about Brad but maybe he has no intent of going back to Night Ranger. That would kinda surprise me because Brad and Kelly were the two that kept Night Ranger going when the other three decided not to. 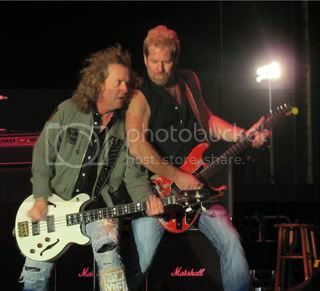 I do think something not normal is going on with Night Ranger. I would like to hear something official from these guys. Well I thought Andrew explained the "Hit Me Baby One More Time" situation quite well when it happened last year. I guess we'll have to ask our news Guru about it! Ever think though that they might have just wanted to take a year off? Night Ranger isn't like Styx, REO, Journey, etc where there are booking agents always wanting to bring them in because they make them money. Night Ranger's tours compared to those other bands listed were very small.. What, maybe 10-15 dates a year? Jodes wrote: Well I thought Andrew explained the "Hit Me Baby One More Time" situation quite well when it happened last year. I am very aware of the Hit Me baby timelines. First Jack said they did not do it because the band was busy in the studio recording a new cd...that was on this site. After outcry, a friend of mine emailed jeff and he got a personal email back and Jeff explained in a more detailed message the entire circumstances....of which I understand...that was first posted on the NR website forum....later posted here. They have spoken about it on their own and Jack said Kelly did not want to do it. Jeff said him and another guy wanted to do it....I will assume that is Brad. That is not the point anyways...the point is they were supposedly in the studio a year and a half ago and according to Jack they were pushing hard to get the cd ready...and could not afford to take a couple days out to do the show. Since than all four guys have been off on there own doing their own things. They also canceled tour dates....and the cd is no closer to being finished than it was over a year ago....if it is.....I don't get the impression they have been together in about a year. It all just seems weird to me. Jack in a play. Brad in Vr, Jeff doing all kinds of things, and kelly in two bands and doing a solo cd (he musta been in at least 6 projects). Believe me.....I hope nothing is afowl but I just get a bad feeling. 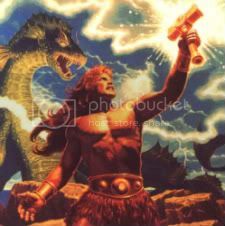 I believe that NR does not want to continue without the core and something is holding it up. Maybe creative differences....or maybe a band member left the group....and not one update to the website in 13 months? I just got a gut feeling. Brad has not and will not be leaving the band. Brad was never a concern for me. He is engrained in Night Ranger. 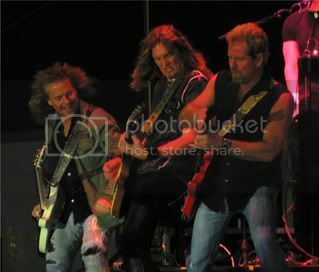 Brad goes back with Jack (and Kelly) to the pre-Night Ranger days. Brad continued with Night Ranger when Ozzy wanted him. 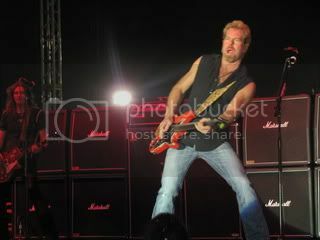 Brad continued Night Ranger with Kelly when the other three were out of the band. I worried a little more about Jeff, because Jeff's name has been left out of some conversations. Jeff has had a little more history of not agreeing with other band decisions. Jeff also did not continue with NR when Brad and Kelly did. And also, has a pretty large history of side projects. 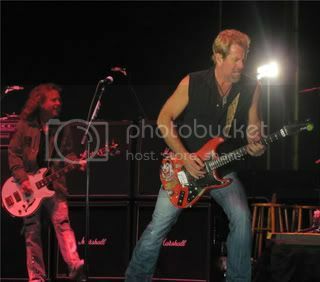 I am glad to hear, Jeff will be on the new NR cd. I really hope that the four originals who are in the band still can keep this going for many many more years. 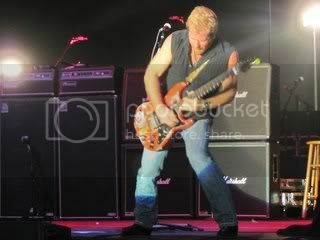 I'm Glad Brad Gillis isn't going anywhere...The Man Rocks!!!! Brad is in fact still shredding with NR. He was mingling with people near the stage on Friday, a few hours before NR's set. He mentioned needing 12 stitches in his right index finger, but it did not affect his playing one bit. He told us that he's sorry if he sucked that night. No worries at all, Brad. You were amazing, as usual. I still can't get over Zeppelin and The Tubes!!! !